On back of upper and lower stretcher, two name plaques: ‘Josephine Butler’. On back of frame, label: ‘Watts Exhibition 1905’. This portrait, one of the latest in George Frederic Watts’s ‘national collection’ or Hall of Fame, was executed from 9 to 13 October 1895, at his house Limnerslease in Compton, Surrey. The sitter is one of a handful of social reformers selected for the series, and her portrait follows those of Samuel Barnett (NPG 2893) and John Passmore Edwards (NPG 3958). Though Watts painted several characterful portraits of old men – notably Cardinal Manning (NPG 1008) – his preference in female portraiture was for youth and beauty. Butler is the only woman to be included in the Hall of Fame series, as a companion portrait of Florence Nightingale was left unfinished. It is very cold & dull, & I have a difficulty in sitting three hours at a time in the Studio, wh tho’ warmed, is a very large lofty room. The cold makes me find it difficult to keep awake. My dear Mr Watts, I want to tell you in writing what it is difficult to say in words. When I looked at that portrait which you have just done, I felt inclined to burst into tears. I will tell you why. I felt sorry for her. Your power has brought up, out of the depths of the past, the record of a conflict which no one but God knows of. It is written in the eyes and in the whole face. There were years in which my revolt was, not against man, but against God; my soul went down to hell, and dwelt there. It was a woe which has left its marks, long after peace had been restored, just as an old tree bears the marks of a storm by which it was blasted long ago altho’ the weather is so calm now that not a leaf stirs. It was rather tiring sitting for the portrait, but Mr Watts is really a very loveable old man. He is so full of thought, & a good deal of sadness, but is gentle and easily cheered. He was so anxious about my portrait that it made him almost ill, when at last he let me see it, he looked at his wife, & then at me & then at Mia, with such an anxious face to see what we would say. I don’t know what to think of it. It is rather terrible. It bears the marks of storms & conflict & sorrow so strongly. The eyes are certainly wonderfully done, you know I have no brightness in my eyes now. He said he wanted to make me looking into Eternity, looking at something wh no one else sees, because he says I look like that & he certainly has given that idea. It is not at all pretty, & the jaw & head are too strong and gaunt. I don’t think my friends will like it. But then he is not doing it for us, as he says, but for posterity; & no doubt it will convey an idea of my hard life work. It is not finished. They say his pictures are seldom liked at first, but that they grow on people, on account of the power in them. The work is painted on very coarse-weave fabric resembling hessian, not a support usually chosen by Watts but occasionally used around this time, as for example with his portrait of the 1st Marquess of Ripon (NPG 1553). As was customary, all pictorial attention is given to the face, while body, clothes and background are sketchily delineated. Butler wears a dark dress or bodice with lace collar and cuffs and a black cap under lace with long streamers, as worn by widows in the mid-Victorian years; a similar cap with a long scarf-like veil is seen in portrait photographs taken by Elliott & Fry around 1890 (see ‘All known portraits, Photographs, 1890s’). 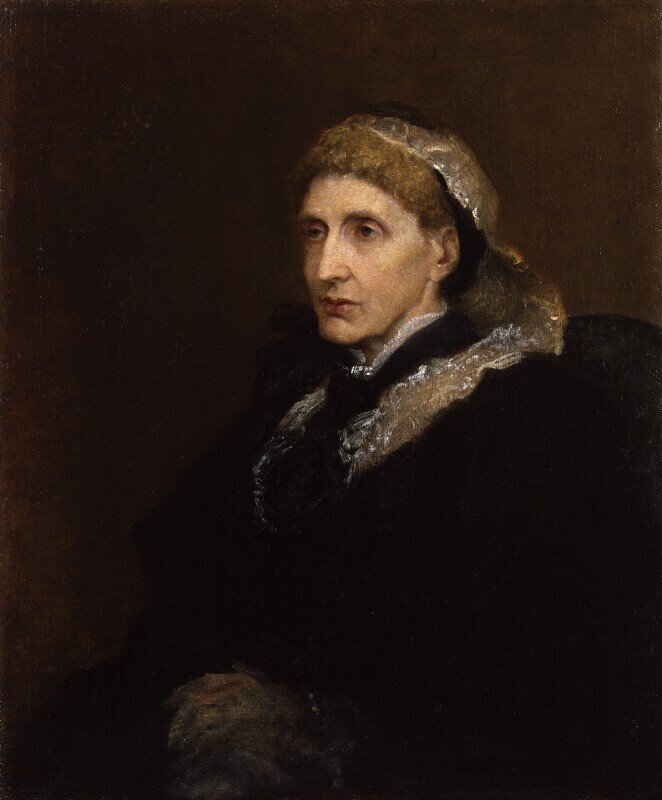 The portrait remained with Watts’s widow and Gallery until the centenary of Butler’s birth, when it was loaned to the National Portrait Gallery for exhibition. In 1935 it was formally transferred to the Gallery under the terms of Watts’s bequest. An undated, unsigned copy of the work, measuring 296 x 246mm, is in charcoal on paper (Women’s Library, London School of Economics, 3 AMS/G/02/20). 1) Letter from Josephine Butler to Rhoda Butler, 31 Aug. 1894, Liverpool UL, Spec. Colls, JB 1/1 1894/08/30(I). 2) Letter from J. Butler to Miss Priestman, 1 Oct. 1895, Women’s L., LSE, London, 3JBL/33/41. According to Mary Watts, there was a preliminary sitting in Watts’s London studio, but the date of this is not recorded; M.S. Watts, MS ‘Catalogue of the works of G.F. Watts’, compiled c.1904–38, 2 vols, Watts G. Archive, Compton, vol.2, p.25; typescript copy NPG. 3) Letter from J. Butler to Rhoda Butler, 4 Oct. 1895, Liverpool UL, Spec. Colls, JB 1/1 1895/10/04(I). 4) Letter from J. Butler to Stanley Butler from Limnerslease, 10 Oct. 1895, Liverpool UL, Spec. Colls, JB 1/1 1895/10/10(I); part quoted Butler 1954, p.186. ‘Father’s life’ probably refers to J.E. Butler, Recollections of George Butler (1892). 5) Letter from J. Butler to G.F. Watts, Oct. 1895; quoted Watts 1912, vol.2, p.251; publ. The Times, 7 July 1928, p.15, when the original letter was in Mary Watts’s possession. 6) Watts 1912, vol.2, p.250. 7) Letter from J. Butler to Stanley Butler, 14 Oct. 1895, Liverpool UL, Spec. Colls, JB 1/1 1895/10/14(I); quoted Butler 1954, p.187. 9) Ormond & Ormond 2012, p.82. 10) Letter from Winifred Coombe Tennant to The Times, 7 July 1928, p.15. Half-length, half-profile to left, wearing black garments and cap, with lace collar and streamers, hands clasped at waist. Bequeathed by the artist, in keeping of his widow until accessioned 1935. Royal Society of Portrait Painters, Annual Exhibition, London, 1902 (28). G.F. Watts Memorial Exhibition, Manchester Art Gallery, 1905 (81). G.F. Watts: The Hall of Fame, NPG, London and Laing Art Gallery, Newcastle-upon-Tyne, 1975 (no cat. no.). G.F. Watts: The Hall of Fame, Watts Gallery, Compton, Surrey, 2012 (22). M.S. Watts, MS ‘Catalogue of the works of G.F. Watts’, compiled c.1910, 2 vols, Watts G. Archive, Compton, vol.2, p.25; typescript copy NPG. Church Times, 27 May 2011 (clipping in NPG NoS [Butler], no page no visible). Ormond & Ormond 2012, no.22, p.83.